Served in store: All day. Minimum $50 order for delivery. Baja Chipotle - NEW !!! 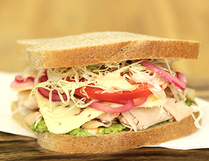 Sliced turkey breast layered with shaved cabbage, pickled red onions, tomato, avocado, pepper jack cheese, a chipotle honey lime yogurt sauce, and salt & pepper mix. 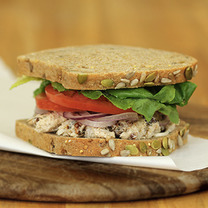 Fresh made on Honey Whole Wheat bread. Roasted Pepper Cheesesteak - NEW !!! 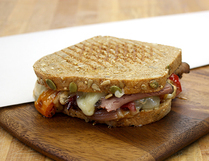 Roast beef layered with melted Havarti cheese, marinated, roasted bell pepper & onions, and chipotle mayo. 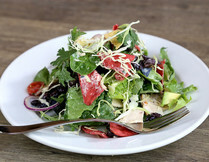 Mexicali Salad - NEW !!! Mixed greens, smoked turkey breast, fresh avocado, shaved cabbage, tomato, red onion, black beans, tortilla chips, and our delicious house-made chipotle honey lime yogurt dressing.